The Rockhampton Musical Union was founded on the 18th August 1888 by the combination of the Liedertafel Musical Group and the Philharmonic Society. Their first choral rendition was The Merry Men of Sherwood Forest in 1894. 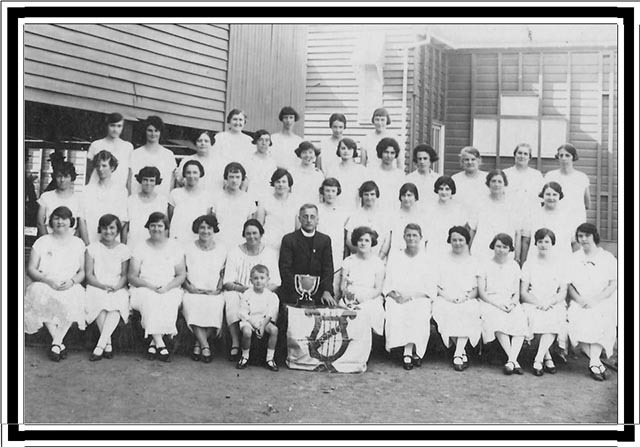 Under the 21year conductorship of Rev E R Streeton (1912 – 1915 and 1921 -1939) the choir enjoyed high membership and a high standard of choral and religious (Sacred) works, culminating in a Second Choral win at the Rockhampton Eisteddfod in 1926. Following the Second World War under the baton of Ivy Brennan the choir continued its winning ways with great success for the Ladies Choir at the City of Sydney Eisteddfod in 1948 when membership peaked at 100. Marjorie Nugent further expanded the choir’s talents for the next 23 years (1953 -1976), reintroducing musical productions in 1955 with The Mikado, and delighting audiences with the introduction of Olde Time Music Hall in 1968, a June Show which continued until 2005. Yvonne Raynor was conductor from 1978 and guided the successful presentation of The Sound of Music in 1979, the opening year of the Pilbeam Theatre. Nita Whyte took up the challenge as conductor in 1983 and the choir showed their strength. In 1987 they won the Chief Choral Contest at the State Eisteddfod in Gladstone and in 1988 were the B Grade Champion Choir at the All of Queensland Bicentennial Eisteddfod in Mackay. The past 20 years have been challenging in this changing world. Under the strong leadership of our executive and management committees the continued conductorship of Nita Whyte of both the Senior and Youth Choirs, and the dedication of some talented stage directors, we have mastered these challenges. Standing out as our greatest success and experience would be the staging of Les Misérables in 1993 with record audiences. This led to a repeat performance in 1995 and a 10 year revival production in 2003 which were both equally as popular, making it a show we will all remember. Combined performances with our talented Youth Choir also proved to be winners. Eisteddfod Choral Competition is high on the choir’s agenda with continued success at State level, particularly winning the A Grade Chief Choral in 1991 and Ladies Chorus in 1997. In 2009 the Choir entered a new era with the resignation of long-term conductor Nita Whyte. Christine Netherwood and Janette McLennan jointly took up the baton and the choir performed successfully in the Queensland Eiteddfod at the Sunshine Coast, achieving the highest mark in the Choral section for their winning performance in the Musical Theatre item. As it has been throughout our history, male singers are always in short supply. We trust that our history will continue and that future generations will proudly carry the RMU name forward.